O boy O boy! When Berry told me, me could come with her to Amsterdam Expo me was really excited. Me was going to learn more about the Ice Age, she told me. Me like the Ice Age, the animals were fuzzy (not blue) and huge. Me especially love the woolly mammoth, a large, elephant like animal with huge tusks and long hair. After me visit at GaiaZOO where me had seen Snuffies family, me was glad to learn more about them. 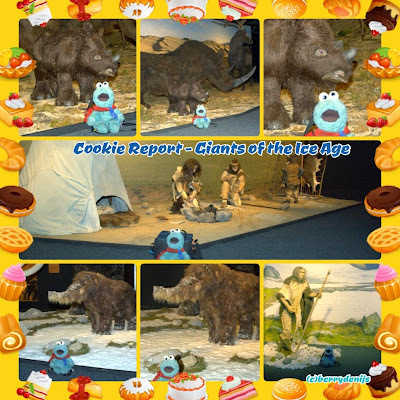 So we travelled to see Giants of the Ice Age. Little did me know the exhibit was so exciting and scary! It really felt like me went back in time to see how the prehistoric man survived. There were all these sounds around me, me imagination was playing little tricks on me. But it is a great exhibit! If it comes to a city near you, you must go. At the exhibit there are all kinds of lifelike and life-size animal statues that tell the story of the huge animals of the Ice Age. 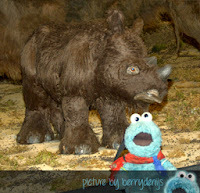 Me really loved the woolly rhino though. Especially the little baby was just too cute! The sabretooth tiger was a little scary. And me loved the Dutch wing of the exhibit. 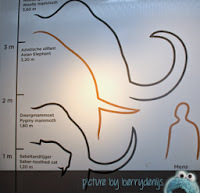 Me did not know there used to live mammoth on the Dutch fields! Even the hyena had ancestors roaming in the Netherlands. In the Dutch wing you can find a fossil hyena dropping. It was kind of funny. But me loved the almost last room of the exhibit. There they were, the ancestors of Snuffie. A nice family of three. Me loved the little one, because he was more of a Cookie Monster size than its mom and dad. But boy these animals were large! Me understand why exhibit is called GIANTS of the ICE AGE. Me sat with the little one for a while before we visited the last room where me felt really tiny next to this mammoth skeleton. It was gorgeous. If you want to learn more about these gorgeous creatures, you must go and see it. 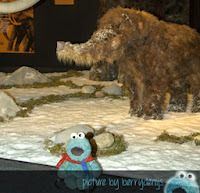 And make sure you say hi for me to the little woolly mammoth!